Now that Dynamic Ads (formerly known as DPA or Dynamic Product Ads) have launched on Instagram, it’s important to make sure you’re doing it right. The more products you have, the more essential it is that you’re running these ads. The pixel implementation can be tricky but once you’ve figured that out it’s the easiest way to scale your retargeting efforts and promote your full catalog of products. It also takes the guesswork out of your creative strategy, since users are getting served up a customized ad based on their demonstrated interests and shopping behavior. The results below are standard; we often see click-through-rates that are 2X higher and cost per acquisition (CPA) can be up to 60% lower in some instances! If you’re targeting a really tight window or just working with low traffic volumes then you may want to use CPM bidding and just try to get your ad served to as many people within your limited audience. For larger audiences, you’ll likely want to optimize on conversions. 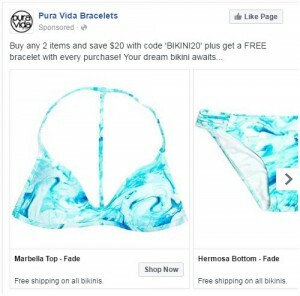 Using taglines like ‘Hurry items are going quick’ or ‘While supplies last’ in your ad copy should help to create the illusion of scarcity so that customers are more incentivized to convert. Offer a promo code or free shipping to these window shoppers and cart abandoners. You’re targeting people who have viewed or added a certain product to cart but didn’t purchase, so they may need that extra discount incentive to push them towards checkout. Depending on how much of a commitment the conversion is, you might want to shorten or lengthen your retargeting window. It should reflect the length of your conversion funnel. If it’s a low-price, low-pressure sale then it’s probably a good idea to stop targeting this user after a 7-14 day window. They likely aren’t going to convert, at least for that particular product at that particular price. Keep them on your radar and try to re-engage them with other remarketing efforts using promotions and new products etc. The great thing about dynamic ads is that they are hard to ignore – the creative is tailored for that exact user and so it’s pretty hard to block out. Right hand column ads are often hit and miss, but you’ll see more success here with products that the customer actually recognizes. We don’t always include Audience Network because if you compare actual link clicks to conversions it often looks like there are lots of misclicks happening; but CPAs are usually decent so if you need that extra scale, then go for it. If you’re an advertiser with multiple product lines then it might make sense to break these out for separate DPA ad sets. By making different product sets according to product type you can then tailor the ad messaging. For example, maybe you don’t want to run discounts alongside new season inventory or a product category with weaker profit margins. Be sure to define your ‘product types’ or ‘product categories’ so that you can easily create and curate different product sets within your catalog. Recent purchasers can be a hard sell, but you can make this customer segment work for you by testing cross-selling campaigns if you have related products and/or items with a greater profit margin that you’d like to promote. In the example below, we’re promoting our necklace and earrings collections to customers who purchased a ring in the last 30 days. Another good cross-selling idea is to base your product sets off of different price points and then try to cross-sell purchasers of your low-end items with more premium products. Looking at your product ID report can be helpful. 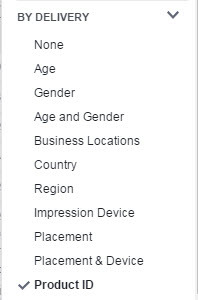 This info is available within the Facebook Ads Manager ‘breakdown’ drop-down, and shows the breakdown of performance by product; you can view which products you’re spending the most money promoting, and the sales performance for that item. This might give you some insight into what products are seeing a lot of engagement so that you can build creative focused around this. If you have a ton of site traffic and browsing activity you should nest out your re-targeting windows and bid lower further down the funnel because these users aren’t quite as valuable. The longer the user goes without converting, the lower the chances they ever will, so you might want to offer deeper discounts to these users as a final attempt to win them over. 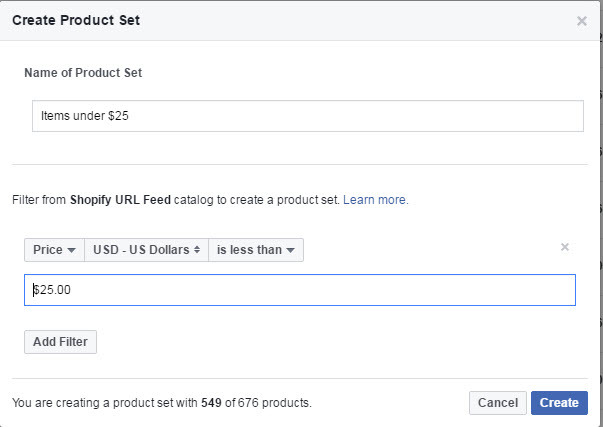 It pays to become a total expert on the Facebook pixel’s requirements for Dynamic Ads. Without ViewContent, AddToCart, and Purchase events firing across your site, Dynamic Ads will not function. Once you’ve got a handle on pixel events, supercharge the Purchase pixel to track revenue and other attributes for your visitors such as account user names, emails and/or phone numbers (for custom audiences). To help you monitor and troubleshoot pixel events, we highly recommend the Facebook Pixel Helper. The easiest way to scale your retargeting efforts and promote your full catalog of products. Check out this success story published by Facebook on our Dynamic Ads work for Sudara!